Understanding that many such conditions can be treated non-operatively with physical therapy, bracing, medication, or activity modification, Dr. Shah guides patients through treatment options and offers surgical treatment when appropriate. 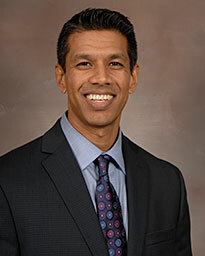 Dr. Shah is affiliated with the Memorial Hermann IRONMAN Sports Institute. His special interests include sports medicine, arthroscopy, and treatment of complex shoulder and knee injuries. He has worked with athletes at the recreational, high school, collegiate, and professional levels using advanced techniques perfected in the sports medicine arena. Dr. Shah is the team physician for Houston Baptist University and the Orthopedic Team Physician for the Sugar Land Skeeters baseball team. He is board certified by the American Board of Orthopaedic Surgery with a Subspecialty Certificate in Orthopaedic Sports Medicine. He is also a member of the American Orthopaedic Society for Sports Medicine, the American Academy of Orthopaedic Surgeons and the Arthroscopy Association of North America. Dr. Shah lives in Sugar Land with his wife and two children. I was in car accident that resulted in a hematoma on left leg, and broken collar bone. The swelling in left leg was so severe there was no feeling in the front of my leg from the knee to my ankle and I was in a lot of pain at the swelling site of hematoma. Dr. Shah removed the huge hematoma and then he put a metal plate and seven screws in my collar bone. Since my surgery I have feeling back in my left leg and collar bone and I am back to work! If wasn't for Dr. Shah and his wonderful staff would still in pain and not back to work. Dr. Shah is an amazing doctor, he explains things and he called after each surgery himself to check and see how I was doing! I highly recommend RBJC to anyone looking for help. They explained every option they had to offer and worked me into their schedule as I needed them to, the entire staff and the operation at the Sugar Land office should be used in every office! They are so efficient and friendly, I had such a wonderful experience! "I would like to thank Dr. Shah for the excellent care I received when I injured my wrist. He was very thorough with his explanation of what was going on and really put my mind at ease. It was a busy day in the office but I never felt rushed or that he was in a hurry. He definitely left me and my husband with a wonderful impression of him. I will not hesitate to return to Dr. Shah when I have future bouts of clumsiness! When I came in to see you I didn't know what was wrong with my foot and ankle. I just knew that I had lost my explosion and it would still hurt after I iced it down. My team was heading into the state playoffs and I wanted to be ready. Even more importantly, I didn't want to have any lingering injuries when I start playing basketball for Boise State University next fall. Since coming to Richmond Bone & Joint and getting my ankle and foot treated, everything has been fine. My team went to the regional finals in the playoffs, and I haven't had a bit of pain while playing. Dr. Shah, you're the best! My name is Connor Thompson and I tore anterior cruciate ligament in my knee leaving me unable to run or compete in sports. I saw Dr. Vishal Shah at the Richmond Bone & Joint Clinic and found him to be very friendly and personable. He did a fantastic job on my knee. After my ACL repair surgery, I felt more confident and quicker then I was even before the injury! The employees at Richmond Bone & Joint Clinic treated me on a very personal level and I found the new clinic facility to be top notch. I want to thank Dr. Shah, who brought me back to competing at a high level in a shorter time than most thought possible. I recommend Dr. Shah to all of my friends. My son had a growth spur fracture of the knee and was not able to walk or bend his knee. He was in so much pain he said it felt as though a truck ran over his knee. Dr. Shah placed him in a knee mobilize for 6 weeks. Le'Mante has always been actively involved in sports and was rather sad that he would not be attending tournaments, but he wanted to get better! Dr. Shah was awesome!! He took his time with us explaining what Le'Mante's condition was and how long it would take to get better. He was so detailed with us in reference to what a growth spur fracture was. Being a concerned mother I had so many questions but Dr. Shah took his time and explained in detail what triggered the fracture. Once he made Le'Mante feel good in spite of the pain I realized then he was such an awesome doctor and wish there were more like him. I wouldn't want this circumstance to happen again, but if it should we know where to go! The clinic was very clean and everyone was so courteous and professional!! I am a 66 year male in relatively good shape my entire life. I had an accident at work that left me a torn meniscus. I had tremendous pain in my right knee and was out of work for 18 weeks. During this time, I began to walk with a stiff knee causing me problems with shin splints. Dr. Shah was very thorough in explaining to me what my injury was and worked with me every step of the way to ensure that i would receive the best medical care possible. His bed side manner and professionalism are second to none. He took the time and went out of his way to make me feel comfortable with the procedure. I had surgery on March 22nd and within 2 days I could feel the difference in my knee. Dr. Shah gained the trust and respect of my family as well. As I was in recovery, he took the time to explain to my loved ones the results of my surgery in layman terms. I would recommend Dr. Shah and RBJC to anyone seeking orthopedic help. "At this level and with this much competition I think the lower rates of return were expected," — Dr. Vishal Michael Shah of the Richmond Bone and Joint Clinic in Sugarland, Texas. Learn more about Dr. Vishal Shah. Orthopedic Surgeon, Dr. Vishal Shah with Memorial Hermann Sugar Land Hospital discusses options for knee surgery and how it helped his patient Phillip Riopelle "leap" for joy.